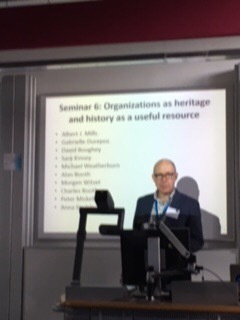 The question of how business organisations make use of their history has increasingly come to occupy the attention of organisational theorists and historians (Suddaby et al, 2010; Poor et al, 2016; Zundel et al, 2016; Foster, 2017; Smith and Simeone, 2017; Hatch and Schultz, 2017). Each firm’s history is unique to itself. As such, it can be classified as rare and inimitable. Provided historical records are appropriately stored and managed within an archive, then it can also be said to be organised. In such cases we can reasonably claim that a firm’s history meets three of the four elements identified by Barney (1991) as constituting a strategic resource. The only question that remains is whether it is deemed to be valuable. Judging by the number of companies that have chosen to invest in constructing and publicising historical narratives about themselves, it would appear that for many executives the answer to this question is: yes. By ‘investment’, here, we are talking about more than the commissioning of corporate histories destined to take pride of place on the C-Suite coffee table. Increasingly it means the construction corporate museums, or visitor centres with historical collections (Stigliani and Ravassi, 2007). It is often manifested in the public celebration of notable company anniversaries or, more durably, in the incorporation of historical images and artefacts into the interior design of company head offices (Barnes and Newton, 2018). More conspicuously, it can involve mobilising historical narratives, characters or events to serve wider branding, advertising or public relations purposes (Lubinski, 2018). The tendency to view history as a malleable strategic resource that can support wider corporate goals may be on the rise, but what does this mean for business archives themselves, the archivists who work in them, and the academic researchers who rely on them? There would clearly seem to be an opportunity here for archivists to demonstrate their strategic importance to their employers, and for historians to develop research projects that might be seen to deliver ‘impact’. But are there also reasons to be cautious? What are the implications of viewing history (and historical collections) as a strategic resource for the way in which archives are valued (and maintained)? Does it affect the types of materials that are likely to be preserved (or discarded)? Will it affect corporate policies regarding access to, and use of, historical records by non-company personnel – such as academic researchers? – The preservation / management of company archives after a firm has ceased to exist. Barnes, V. and Newton, L. (2018), ‘Visualising organizational identity: the history of a capitalist enterprise’, Management and Organizational History, 13 (1), pp. 24-53. Barney, J. (1991), ‘Firm resources and sustained competitive advantage’, Journal of Management, 17 (1), 99-120. Foster, W.M., Coraiola, D.M., Suddaby, R., Kroezen, J, and Chandler, D. (2017), ‘The strategic use of historical narratives: a theoretical framework’, Business History, 59 (8), pp. 1176-1200. Hatch, M. and Schultz, M. (2017), ‘Toward a theory of using history authentically: historicising in the Carlsberg Group’, Administrative Science Quarterly, 62 (4), pp. 657-697. Poor, S., Novicevic, M., Humphreys, J.H. and Popoola, I.T. (2016), ‘Making history happen: a genealogical analysis of Colt’s rhetorical history’, Management and Organizational History, 11 (2), pp. 147-165. Smith, A. and Simeone, D. (2017), ‘Learning to use the past: the development of a rhetorical history strategy by the London headquarters of the Hudson’s Bay Company’, Management and Organizational History, 12 (4), pp. 334-356. Stigliani, I. and Ravassi, D. (2007), ‘Organizational artefacts and the expression of identity in corporate museums at Alfa-Romeo, Kartell, and Piaggio’. In L. Lin, D. Ravassi, J. Rekom and G. Soenen (eds.) Organizational Identity in Practice, New York: Routledge, pp. 197-214. Suddaby, R., Foster, W.M., Trank, C.Q. (2010), ‘Rhetorical history as a source of competitive advantage’, Advances in Strategic Management, 27, pp. 147-73. Zundel, M., Holt, R. and Popp, A. (2016), ‘Using history in the creation of organizational identity’, Management and Organizational History, 11 (2), pp. 211-235. We are delighted to invite all colleagues and doctoral researchers to Prof Constantine Sedikides seminar taking place on the 4th December, Wednesday 12pm, Joint meeting rooms in the Work and Organisational Psychology Department, 8th floor SW, followed by lunch. Prof Constantine is currently head of the Centre for Research on Self and Identity (CRSI) and a Professor at the university of Southampton. The seminar will address the relevance of nostalgia in organisational settings. The emotion of nostalgia will be defined and clarified. Then, representative research will showcase the role of personal nostalgia in acting as a buffer against procedural injustice. Finally, representative research will showcase the role of organizational nostalgia in acting as a buffer against employee burnout and as a resource fueling work meaningfulness. 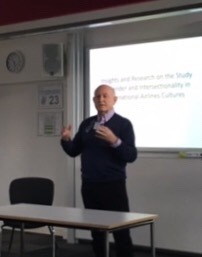 Professor Constantine’s research focuses on self and identity (including narcissism) and their interplay with emotion (especially nostalgia) as well as motivation, close relationships, and group or organisational processes. This research has been supported by grants from many national and international funding agencies, such as Economic and Social Research Council, Leverhulme Trust, British Academy, and National Institute of Health. The research has culminated in approximately 400 articles or chapters and 15 volumes. He has received several awards, including Daniel M. Wegner Theoretical Innovation Prize (Society for Personality and Social Psychology), Distinguished Lifetime Career Award (International Society for Self and Identity), Kurt Lewin Medal for Outstanding Scientific Contribution (European Association of Social Psychology), and The Presidents’ Award for Distinguished Contributions to Psychological Knowledge (The British Psychological Society). Before joining University of Southampton as Director of the Centre for Research on Self and Identity, Constantine taught at University of Wisconsin-Madison, USA, and University of North Carolina at Chapel Hill, USA. He holds a BA from Aristotle University of Thessaloniki, Greece, and a PhD from The Ohio State University, USA. Please do confirm attendance by replying to this invitation via email to Linda Watts (l.watts1@aston.ac.uk). A light lunch will be provided after the seminar. 14.15-15.00 Amon Barros, FGV-EAESP, and Scott Taylor, Birmingham Business School – The role of Brazilian think tanks in the public debate on management and organizations. Business historians excel in the classroom. They do so by applying history to a variety of different topics and using a set of different approaches. While in recent years, business historians have started sharing collections of course syllabi, there are very few opportunities to engage in discussion about how and in which contexts business history is being taught. The workshop provides a platform for business historians to learn and share the content and techniques of what they are teaching and to discuss ways to collaborate more effectively about pedagogy. This includes not only sharing content and methods but also discussing opportunities for joint case development and staff exchanges between schools. To allow for a focused debate, we have invited presenters with three concrete examples of courses rooted in business history but pushing its frontiers in new directions and targeting new audiences. They will present innovative new course and teaching initiatives in (i) Public History, (ii) Financial History and (iii) Entrepreneurial History. We seek to sample their concrete examples of course design, module structure and session planning as well as discuss new experimental ideas in each of these areas. All three topics can be understood as pilots when it comes to successfully introducing business history to history departments and business schools as well as engaging a broader public. Participants will come away with usable ideas about both content and pedagogical practice for introduction in their classroom and public outreach activities. Participants are explicitly encouraged to bring their own case ideas, session plans, or module concepts for common discussion. The workshop will take place immediately before the BHC meeting and at the same location. Participation in BHC meeting and workshop is possible. If you have any questions, please contact Christina Lubinski (cl.mpp@cbs.dk) or Dan Wadhwani (dwadhwani@pacific.edu). We gratefully acknowledge the financial support from the “Rethinking History in Business Schools” Initiative at Copenhagen Business School’s Centre for Business History. For example, the Business History Conference website on course syllabi: http://www.thebhc.org/syllabi or the Harvard Business School Guide to Business History Courses Worldwide: http://www.hbs.edu/businesshistory/courses/resources/Pages/default.aspx. For workshop details see, http://thebhc.org/classroom-frontiers.To register for this workshop, use the BHC annual meeting registration form. For general information on the BHS annual meeting, see http://thebhc.org/2018-bhc-meeting. Today the last ESRC seminar is taking place at Exeter University. Mick introduced a great line up of speakers, including Gabie Durepos, David Boughey, Sara Kinsey, Michael Weatherburn, Mick Rowlinson, Alan Booth, Morgan Witzel. The day is starting with a keynote by Albert Mills, introducing his work on gender and organizational history, with a dash of personal history thrown in. The day will conclude with a round table with Charles Booth, Peter Miskell and Anna Soulsby, and the obligatory drinks reception (prosecco and cake).